The workplace is rapidly changing. Technological advancements, global development and shifts in society will all affect how we do business in the future. Thanks to AI, all human tasks could be performed by robots or machines by 2051. AI is now apparent in almost every industry, whether you work in healthcare, communication, education, law, finance… the list goes on! The latest AI workplace trend is the use of chatbots: a computer program which can interact with humans in an auditory or textual format. They have already impacted the workforce, performing a wide variety of tasks, such as answering customer questions or behaving as personal assistants. In fact, almost 20% of companies now use these devices. On a larger scale, AI has transformed many healthcare processes. For example, it’s made mammogram reviews 30 times faster and with a higher accuracy rate of 99%. This proves that if we work alongside AI rather than fear it, we can achieve breakthroughs in countless industries. Advancements in technology have created new jobs for well educated, highly skilled workers, such as computer programming and data analysis. As a result, many companies are suffering from a skills shortage, i.e. there aren’t enough workers with the appropriate skills to fill certain positions. And this problem will exacerbate. For the youngest generation, generation Z, 65% of the jobs they’ll need to fill don’t even exist at the moment. To address this issue, companies will start to upskill and retrain their current employees. Ideally, employees will be able to perform multiple roles within the organization, helping them to adapt easily to new positions. As well as training employees for cognitive skills, companies will also value those with skills you can’t train, which can’t be performed by AI, referred to as soft skills. 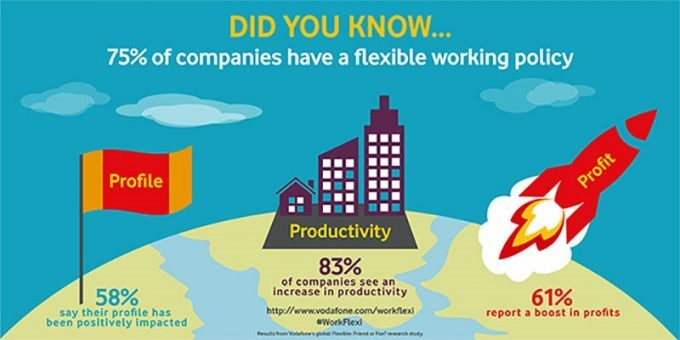 The ability for all workers to stay connected and interact from almost anywhere will allow for more flexible work. Companies are increasingly allowing employees to work remotely, from co-working spaces, offices abroad or even from the comfort of their own home. Significantly, the latest report concluded that 4 million US professionals now work remotely. This popular workplace trend is enabling more and more professionals to work independently, as a freelancer for example. In fact, freelancers now make up a staggering 35% of the US workforce, a number set to increase until they make up the majority by 2027. So, gone are the days when all workers are needed in the office from 9am until 5 pm. Indeed, thanks to advancements in technology, all employees can technically be connected 24/7. Recognizing this, companies are starting to offer more flexible schedules, taking into account certain employee constraints. Millennials are always looking for new experiences, whether that means a promotion, a new position, a complete change of industry or even moving to another country. Unlike previous generations, they are highly unlikely to stay in one job for their entire career. As a result, companies will no doubt experience a higher employee turnover. In fact, 20% of Millennials already change careers within 12 months, and it’s been predicted that 2/3 will leave their current jobs by 2020. Another surprising, and slightly scary, factor which will increase turnover is employee burnout. Our ability to always remain connected will put more pressure on employees to respond to emails and phone calls, even after leaving the office. It is now thought that 1/5 of engaged employees are at risk of burnout. So to tackle this problem, more countries will be encouraged to follow in the footsteps of the French government and introduce a “right to disconnect”, protecting employee health and wellbeing. Thanks to the continuous rise in globalization and immigration, the workforce is becoming ever more diverse. In response, more laws against discrimination have been enforced. There is more gender equality in the workplace and steps are being taken to reduce the current gender pay gap, which sees women earning on average only 77.5% of the salary earned by men in the same position. In the future, more men and women will equally share the task of managing work and family time, destroying the stereotypical image of a housewife. There will continue to be more opportunities for those with disabilities, building on the voice recognition software and alternative keyboards already available in some companies. Companies will respond to the aging population by providing more retirement benefits and equal opportunities. In fact, around ¾ of the American population are fully prepared to work beyond retirement age, and will certainly benefit from the increased flexibility already offered by many companies. Change is the only constant in this world, and it certainly applies to the work environment. Thanks to continuously evolving workplace trends, businesses will be unrecognizable by 2050. That being said, we’ll have access to brand new opportunities and challenges. Get ready! For more information on changes in the workplace, check out our blog!